Martin Luther College, The WELS College of Ministry in New Ulm, MN, live streamed their evening Compline service from August 23, 2010. I composed the liturgical music for this setting of Compline many years ago. It's nice to hear it used! What a beautiful chapel to worship in! Thanks to MLC Audio for recording it! Just in case someone lost theirs (and parents wonder what we talked about in class), here are the handouts for all my classes from WLA's Orientation Day 2010. Just a reminder that Picture Day is September 2, 2010 and all choirs will have their pictures taken! 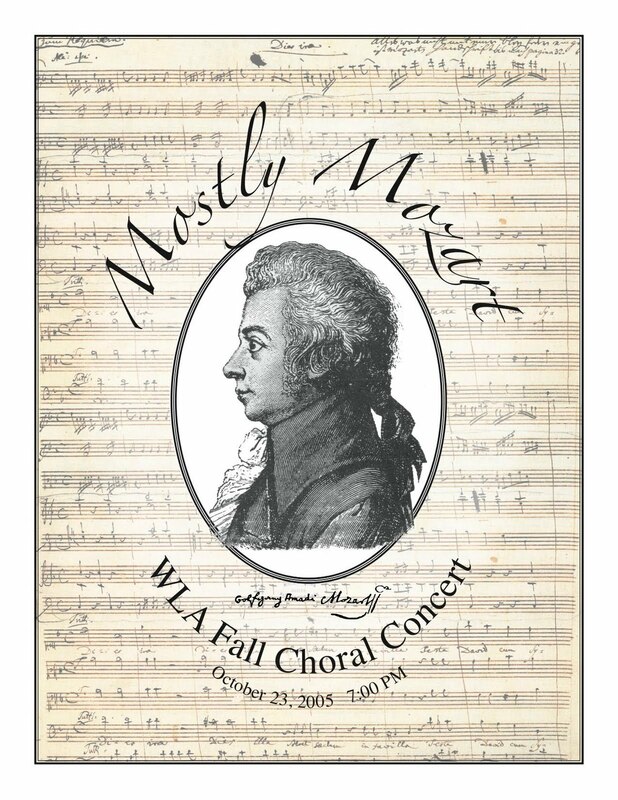 Check our the Concert Attire on each choir's handout for what they should wear for Picture Day and every concert. 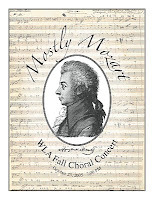 UPDATE 8/16/10 – The time of the 12.22.10 Christmas Concert was corrected to 1:00 PM and WLA's address was added to the bottom. 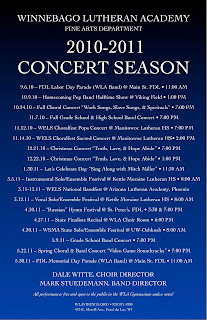 Click the poster image on the left to download or print the WLA 2010-2011 Fine Arts Department Concert Season poster. 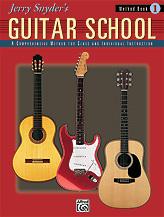 I will be handing them out at the K-12 inservice on Monday, August 16, 2011 to the teachers of the WLA association. I will be sending posters out to all the association churches once school starts. If you are a WELS church in the WLA Association and don't get a poster, please call me (920-251-4490) or email me (dawitte@wlavikings.org) and I will happily send one to you. 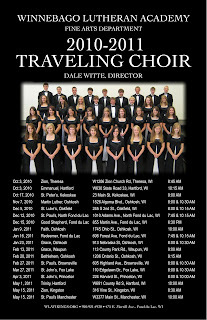 I've just completed the 2010-2011 Traveling Choir Church Schedule. Click here for the link on Google Docs. From there you can print a hardcopy for yourself. 1. The festival weekend is November 12-14, 2010.
b. Show at the Capital Civic Centre in downtown Manitowoc. 4. Click for choir divisions and music list. Recently, I had the opportunity to share some of the reasons why I program my high school choir concerts using themes with the other WELS high school choir directors at our 2nd "Annual" WELS Choral Dialogues. I like themes because they are a creative challenge. 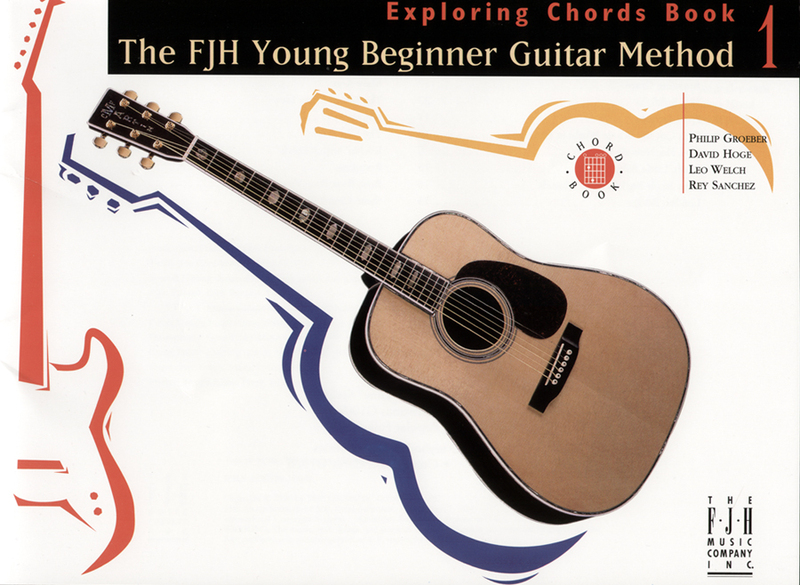 Sometimes it's following an idea, like "Song of the Civil War" or "Rhythm". Sometimes, it's following a composer, like Mozart, Gershwin, or Paul Manz. Other times the idea for a concert comes from a word, like "Light" for a sacred Christmas concert, or a certain piece of music becomes the central focus for a concert, like Eric Whitacre's Lux Aurumque. The following is a partial list of concert themes I've tackled over the years at Winnebago Lutheran Academy. 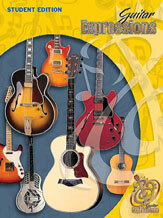 Where I have them electronically, the programs for each concert are linked. "For Unto You is Born This Day"